Blue Bamboo specializes in providing fast, reliable and industry compliant wireless electronic payment technology that enhances mobile workforce productivity and security without the premium cost. With its sleek design, the H50A wireless POS terminal is ideal for businesses operating in mobile environments who need to secure electronic payments in an easy, portable and affordable manner. The H50A has a large menu driven LCD display to quickly navigate through POS payment applications along with mag-stripe and smart card readers that enable acceptance of credit, debit, gift and loyalty, and stored value cards as required in the field. Companies today rely on their mobile workforce to enhance services and sales in a more proficient and secure manner. 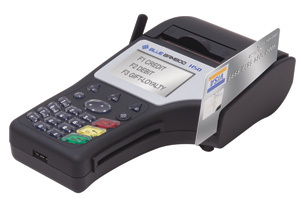 The Blue Bamboo H50A Terminal delivers fast, reliable and secure EMV (Level 1 & 2) and PCI-PED compliant payment transactions. Created with portability in mind, the sleek, ergonomic, and light weight design of the H50A is suitable for a variety of mobile environments. Out of the box, the Blue Bamboo H50A gives merchants the rich feature set they expect from a wireless payment device without paying the premium cost. By swiping cards at the point of sale, merchants benefit from the time savings and enhanced customer experience while increasing sales, reducing processing fees, reducing fraud and minimizing losses occurring from non-swiped transactions; all of which contribute to a quick return on investment. User: Integrated PIN pad with DES, 3DES and RSA encryption. Interface: 128x64 pixel backlit LCD display. Audio output. Keypad: numeric, function and screen addressable keys. Printer: Embedded thermal printer, up to 12 lines per second, 203dpi. Card Reader: 3-track magnetic stripe reader/ IC card reader. Contactless: ISO 14443 A/B, FeliCa and Mifare. Processor and Memory: Secure 32-bit RISC Processor. 32MB SRAM. 32MB Flash. Power: Battery: 1400mAH, 7.4V.AC power adapter: 100-240V 50/60 Hz.